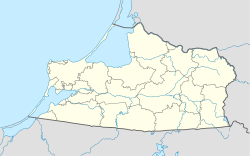 Kaliningrad (Roushie: Калинингра́д; Pols: Królewiec; Lithuanie: Karaliaučius; Greek: Kalininopolis) is a seaport an the admeenistrative centre o Kaliningrad Oblast, the Roushie exclave atween Poland an Lithuanie on the Baltic Sea. The territory, the northren pairt o the umwhile East Prussie, borders on NATO an EU members Poland an Lithuanie, an is geographically separatit frae the rest o Roushie. Oreeginally named Königsberg in German (Roushie: Кёнигсберг, Lithuanie: Karaliaučius, Pols: Królewiec, Auld Prussian: Twānkstathe an "Kunnegsgarbs", Laitin: Regiomontium), the toun wis founded in 1255, an wis lairgely destroyed durin Warld War II. Its ruins wur occupied bi the Soviet Airmy in 1945 an its German citizens forced oot. It wis renamed Kaliningrad in 1946 in honour o Mikhail Kalinin. At the 2002 Census, its population wis 430,003, an increase frae the 401,280 recordit in the 1989 Census. Its ethnic composition is 77.9% Roushies, 8.0% Belaroushies, 7.3% Ukrainians, 1.9% Lithuanians, 0.6% Germans, and 0.5% Poles. ↑ "Twin Cities". The City of Łódź Office. (in Inglis and Pols) © 2007 UMŁ. Retrieved 2008-10-23. ↑ "Groningen - Partner Cities". © 2008 Gemeente Groningen, Kreupelstraat 1,9712 HW Groningen. Retrieved 2008-12-08. ↑ "Ireland and Russia build a stragic partnership". Retrieved 2008-12-08. Wikimedia Commons haes media relatit tae Kaliningrad.